LINCOLN SQUARE — Patti Colandrea's pet-grooming and boarding business, Bark Bark Club, is across the street from the Care for Real food pantry. It struck her one day that many of the people waiting in line for food likely had undernourished pets at home, prompting Colandrea, beginning in 2010, to coordinate a monthly pet food pantry with Care for Real. "I just don't feel anybody should go hungry in this country — that goes for our pets, too," she said. Colandrea's Edgewater operation, serving 200 animals per month, is one of three to receive an assist from a hefty donation secured by the 47th Ward office. Hefty as in 25,000 pounds of pet food. 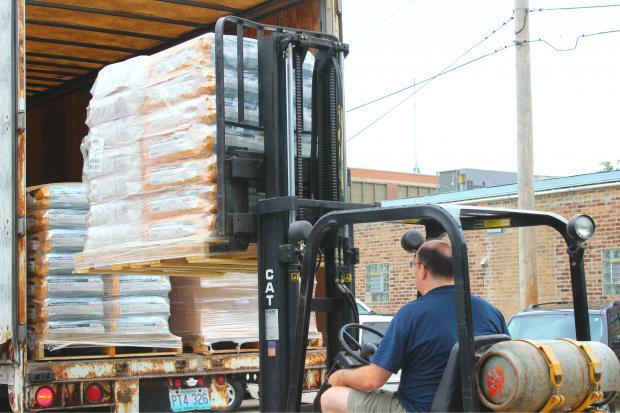 On Friday, a semi pulled into the 4100 block of North Rockwell Street, where volunteers waited to unload and divide 27 pallets of cat and dog food. "My tail's been wagging, I'm so excited," said Dara Salk, the 47th Ward staffer who secured the donation from the Banfield Charitable Trust, which is dedicated to keeping pets and their owners together during hard times. It took Salk months to arrange the delivery as she put out a call for a forklift, a trailer for transportation and anyone willing to store several hundred bags of pet food. "It was not an easy task, but how can you say no to that kind of gift?" Salk said. Found Chicago, a dog rescue organization at 4108 N. Rockwell St., stepped in with storage. A neighboring business, GP Albums at 4045 N. Rockwell St., came through with a forklift. And 47th Ward resident Brad Snook offered up his trailer, capable of holding as much as 6,000 pounds. "These are our neighbors, giving their time, energy and machines," said Salk. Snook hauled away three and a half pallets earmarked for the Lincoln Square Friendship Center food pantry, 2733 W. Lawrence Ave. The center opened its doors to people on Thursday for the first time and will add a monthly pet food pantry in October. Beneficiaries of the largesse also included PETsCan, which operates under the auspices of the Rush Alzheimer's Disease Center and focuses on helping the elderly and their pets. The donation "allows us to serve more seniors and provide more food," said program director Stacy Powell-Bennett. "Pets encourage social interaction, exercise and relieve isolation" among seniors, she said. "It's important that they keep their pets and all those benefits." Veterinarian Joe Bernard said he often sees owners spend what little money they have on their pets while going needy themselves. Pet food pantries "certainly are not a long-term solution," said Bernard, but they can "improve the overall health" of both humans and animals. As Colandrea loaded up twi vans bound for Care for Real, she couldn't contain her excitement or gratitude. "It's just very rewarding knowing animals aren't going hungry," she said.